At Kaleidoscope, your voice matters. When it comes to programming, we want to know what YOU want to do, and that’s why once a month we hold a “House Meeting” where you can give input about our programming. Want to learn how to garden? We’re growing vegetables in the backyard! Want to hold more discussion groups? We’re on it. Want to learn how to cosplay? Let’s see what we can do! Whatever it is you’re interested in, we’re going to try and make it happen (within reason!). In addition, you can always count on there being programming once a month that includes: arts, cooking, game nights, discussion groups, health and get-fit programming, movie nights, open mic, and more! For a complete schedule of what we’re up to, check out our calendar, updated monthly. 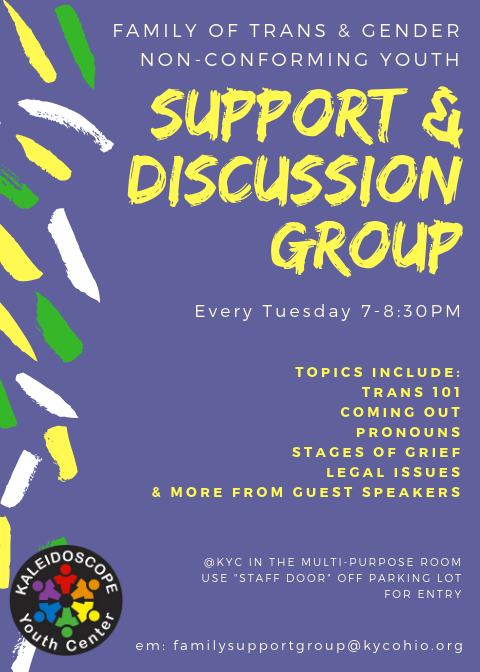 Genderscope: A safe, affirming space where trans, gender non-conforming, and queer youth can come together to build community, discuss issues related to gender identity and expression, and gain support from peers who share in experience. Family of Trans & Gender Non-Conforming Youth Support & Discussion Group: Are you a parent or family member of a trans or gender non-conforming youth? Join us every Tuesday in this parent-facilitated group where you can have a safe space to discuss a variety of topics, gain support, and have all your questions answered. Meets every Tuesday 7-8:30pm in KYC's Multi-Purpose Room. To enter, please use the door marked "Staff" that is off the parking lot.